What is an Orange Squeezer? I have been selling a much higher ratio of the Bi-Comprossors than I had expected. I guess people think it's a better deal to get both, even if they are not sure about the Juicer. Many who are buying them are emailing me back and telling me that they LOVE the JUICER side! Most have never tried a Dan Armstrong O.S. but when they do they are surprised at how great they sound. 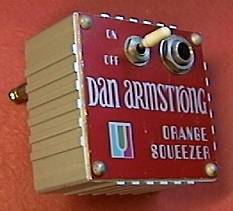 The Dan Armstrong Orange Squeezer (OS) is legendary for its smooth compression and "squashing" tone as used on many Steely Dan (My Old School by Jeff Baxter etc), Doobie Brothers, Dire Straits (Sultans Of Swing), and other classic albums. Jay Graydon emailed me and told me that he played the solo in PEG by Steely Dan with the orange squeezer. Jay also used it on countless songs heard on the radio and uses it for recording all the time. Now he is using our JUICER pedal, read about it on Jay Graydon's web site! Playing the JUICER, the attack of each note is compressed and the decay of the note is brought up somewhat, something like a tube amp's natural sag. There is not as much signal and noise amplifying "sustain" (swell) as some compressor/sustainor pedals like the Ross, MXR Dynacomp, Boss CS-2 etc. The OS is awesome sounding, however there are many limitations in its original stock form. When OFF, the sound was muddied as the little toggle switch used was not a true bypass switch so your top end was lost. Also this effect was not really a "pedal" but a small box which was meant to plug directly into your guitar (not possible with a strat) or amp (too far away to turn on/off easily). So even though the sound was outstanding many people could not use them. Note the MUTRON tuning fork symbol in the picture, these were made by MUTRON for Dan Armstrong. Some were made in the UK in later years but they are generally not considered as good as the US made originals. Looking for a Clean boost? 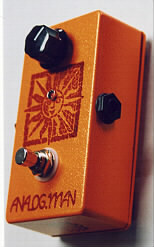 If you think you need something like the KLON, the JUICER pedal may do the trick for you!! It is not transparent (it adds a bit of grit and of course compression) but it may be just what you need. STACKING!! The Juicer is the ultimate to stack into an overdrive or distortion pedal, to bring it alive and add some nice grit to the attack! I found an awesome use of the Juicer, to kick a small tube amp for PURE TUBE DISTORTION with an improved sound! One of my favorite amps is an old DeArmond R5 tube amp, the one Steve Kimock and Billy Gibbons love. Cranked all the way it gets really distorted but a little too loose sounding sometimes. I turned it back to 8, then hit it with the Juicer and it really came alive!! Awesome sustain, tigher sound, with real tube distortion. I couldn't stop playing... you can try this on any small tube amp like a Fender Champ or the Gibson Les Paul Jr amp (another of my favorites). There is also a "reissue" of the 1970s Dan Armstrong OS available made by by WD products. The circuit is similar to the original but suffers from a few problems like a different chip which does not sound good and the use of several other different components (cheap diode, FETs, and CAPs). The original used a 4558 chip while the reissue uses a higher tech chip which uses different pins and just does not sound right. They also suffer from poor construction and quality due to being assembled cheaply in a third world country. I talked to Dan Armstrong in England about the WD and he said they can not even be made to work right, he has nothing to do with them. The Juicer can be used to boost your signal- it gets pretty loud. There is not much control over the compression amount but the BIAS trim pot can be used for more or less of a squashing. With more squashing there is less volume available. It's a great sounding, simple pedal!